Hearts boss Robbie Neilson believes Sunday's clash against league leaders Celtic will provide a good spectacle as both sides "want to play football". The Edinburgh club, in third place in the Premiership, face Celtic at the beginning of a "hectic schedule". "These are great games to be involved in because you can play football in them," Neilson told BBC Scotland. "I expect it to be a tactical game. If we get a result then it brings us closer to the top of the league." 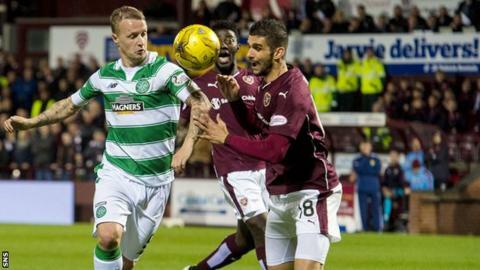 Hearts, with three draws and a defeat in their last four league games, will be aiming to halt that winless run at Tynecastle. "Since I've been the manager here the best we've got is a draw against [Celtic]. I'd like to try to get three points," said Neilson. "We know what we want to do against Celtic"
"We've got a hectic schedule: we've got Dundee United and Kilmarnock then Aberdeen. But it's a huge game on Sunday and we need to ensure we focus totally on that. "It's important that you try to get through it. We've got a game in hand over Aberdeen; we're still in a good position." Neilson says his players are looking forward to facing Celtic, adding: "We know what we want to do and the way we want to play. "A lot of the games you play in Scotland, it's really difficult to play football because of the way teams set up and play. But Celtic want to play football and we want to play football, so I expect the ball to be passed well." Celtic manager Ronny Deila has received criticism for his side's recent form but Neilson does not believe that will have a bearing at Tynecastle. "When you're head coach of a huge club like Celtic then there's always going to be pressure on you," Neilson added. "Ronny will handle that as he always has done: very well. I don't think that will have any influence on the game."